Linden Hills Holiday Market serves up fresh, unique food alongside hand-crafted gifts. Shoppers crowd the lanes between stalls, browsing for holiday gifts and treats for themselves. The scent of pine wafts through the air, intermixing with the warm spices of waffles baking and egg rolls sizzling. Besides smells, the air is filled with the clamor of chatting and rustling of goods as everyone sifts through the options at the Linden Hills Holiday Market. 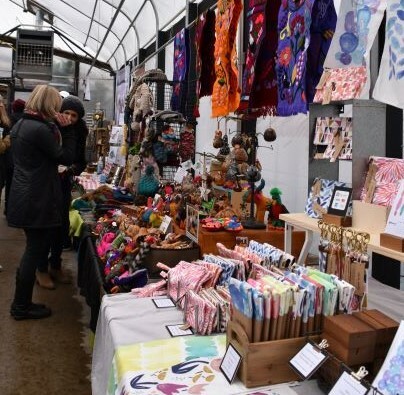 In partnership with the Minneapolis Craft Market, the event is hosted at Sunnyside Gardens every Sunday and allows for a farmer’s market fix even as the weather dips cooler and cooler — with the additional benefit of gift shopping from small, local makers in a festive environment. “You’re smelling waffles, cooking, eggrolls. You’re seeing all the Christmas trees in the lot… It’s bustling and festive,” Hayley Matthew-Jones, founder of the Minneapolis Craft Market, said. Unlike a typical farmers market, this holiday-focused event hosts both handmade goods and small-batch food in one place so shoppers can get breakfast when the market opens up at 9 a.m. and shop for their gifts until it ends at 2 p.m.. The vendors vary slightly week to week, but there are always plenty of options with 70 plus sellers in the indoor space. “We have it packed to the gills with gifts and holiday items, and it’s a really good mix there,” Matthew-Jones said. From specially crafted coolers for beer cans and growlers to sweaters stitched for fur babies, the event promises to have something for even the hardest person to shop for — if nothing else, there are delicious, locally made chocolates and baked goods that can satisfy anyone. In particular, Quebracho is a brand-new business, starting with a pop-up at the holiday market to sling their hand pies, empanadas and charcuterie. “At the heart of this business is replicating the concept of a Sunday in Argentina, a weekly gathering where family comes together and enjoys a meal together. It is a day that can last for hours, in which the sense of weekly responsibilities just simply disappears and is replaced by laughter, anecdotes, jokes and lots of food,” Belen Rodriguez, Quebracho’s owner, said. It is fitting then that their businesses launched on Nov. 4 at the Sunday market, which does not sound too different from those Sunday gatherings. “At times, I was getting so engaged in conversation that I might have been the one holding up the line. People in Minneapolis are incredibly welcoming and receptive and I feel extremely grateful that I was given a chance to bring this new concept to town,” Rodriguez said. Unlike some of the other events for local shopping that pop up through December, this one is particularly large. It is the largest event that Minneapolis Craft Market does all year long. “It’s a really dense shopping experience. It’s very much a destination,” Matthew-Jones said. Vendors and visitors alike all come together to shop and eat. This event occurs every Sunday until Dec. 23, but vendors fluctuate week to week. To see more details for the day you plan to attend, find the event on Facebook.